Original Superbird Bumper Jack or Jacks? 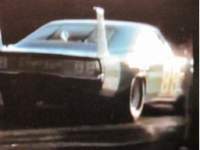 DodgeCharger.com Forum > Discussion Boards > Aero Cars (Moderators: Chryco Psycho, hemigeno, firefighter3931, Charger-Bodie) > Original Superbird Bumper Jack or Jacks? Re: Original Superbird Bumper Jack or Jacks? John,my jack is original to the car,T style,mast is exactly 33 1/2" with small hole on the end,no date code,just A stamped below handle insert. Hook is 2931 103,vendor 10961,base stamped A-B. I am beginning to wonder if they cut the masts at random lengths of a longer piece? Thanks for your measurements and details! Thanks for taking the time to post your information on bumper jacks! With your unrestored Superbird we have 33 1/2", 34 1/4", 34 3/4" and 34 3/4" on mast length so far. Over the past couple of weeks I have reached out to friends who own original Superbirds to find out information on the bumper jacks. I also made a trip to Troy Angelly's shop who has 2 Superbirds there and contacted another shop that has 2 more Superbirds there. 1) All of the original jacks are of the "T" or "Y" mast type and none have been the tubular type! So far we have one reported at 33 1/2" long but the majority are 34 1/2" +or- 1/4" and one at 36 5/8" that I suspect may be a C body mast? 2) All of the original jacks have gray painted A-B bases with the extra hole drilled at the 4:30 position for other applications. 3) All of the original jacks have gray painted hooks with part number 2931 103 stamped into them and the vendor code 10961 stamped into them using the "small" font. 4) all of the original jacks have gray painted mechanism's with the oval strengthing depression running along the hook angle. So far we have found one mechanism as early as 9 E or May 1969 along with a couple of 9 J September, several 9 K October and a couple of 9 L November with none 9 M December. 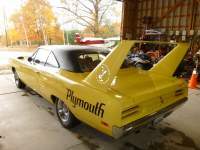 For those of you now looking for a correct jack for your Superbird as of 11/6/18 there is one listed on the Detroit Craigslist site under Mopar for $500.00! Thanks for all the help on this! I don't even own a Bird, but I'm all jacked up about this thread. Good info. Always great to get the facts out there. I can fix you right up !! 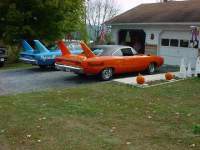 I have been asking our member graybo about details on his LOW milage and original Superbird items. The jack mechanism is painted gray and the date code is 9L or November 1969! Now onto the tire iron! My first picture is of the graybo tire iron measured the simple way that I asked and measures right at 17 1/2"
I didn't want to get into angles corners and all that. The second picture is of another Superbird tire iron that measures just under 18"
The third picture is of the socket size for original assembly line lug nuts. So when your checking your tire irons find a 3/4" headed bolt and see if it fits? The last picture is of some assembly line NOS lug nuts. I dug these out to measure the size for the tire irons. If you notice in the picture these are not as nice as the reproductions. The center of the face have all differant types of shapes. The lug nuts are not perfect castings and there are lines down the sides of most! mannn... you guys dont know jack s***.. LOLOLOL Just messing. here is one matches your description. going for sale in parts section. I see you sold the jack, I sent you an email about 4 minutes after you posted it with no reply. Guess i was too slow... EDIT... HA.. sold to me Thanks! Recently someone contacted me about the bolt for the spare tire hold down stud. So I thought I would attach a couple of pictures here since it's a jack related item. The correct bolt is a "H" headed black phosphate bolt with a black phosphate nut-washer.